A few weeks ago, the charming small town of Old Fort kicked off its first ever Historic Old Fort Farmers Market. Every Thursday at 3pm at the yellow train depot on Main Street, you can find fresh food and flowers grown by local farmers. It’s still brand new, which means as a visitor to a smaller market, you have the chance to actually meet and get to know the farmers, you don’t feel rushed or bogged down by crowds, and you don’t have to sift through tons produce before you find something you like. Small town farmers markets are the best. Brigette stopped by the Historic Old Fort Farmers Market last week and picked up some fantastic fresh lettuce, white cucumbers and a bean she’d never seen before (pictured above). 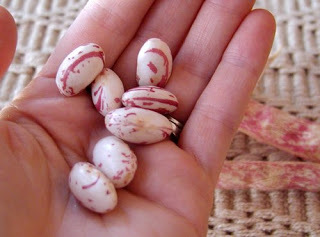 It’s commonly called a cranberry bean, but further research (thank you, Google), shows that it is likely a hybrid of the original “true cranberry bean”, which is deep red, and a white bean. 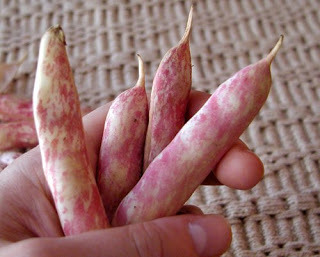 In Italy, it’s called a borlotti bean. Nonetheless, it’s a most beautiful and artistic looking bean. The taste is similar to, but better than, a pinto bean. Even the shells are artsy, perfect for an area with such a rich local arts and crafts history. This entry was posted in Uncategorized and tagged food and drink, Old Fort / Andrews Geyser, Summer by Inn on Mill Creek. Bookmark the permalink.